A bench may be the logical choice for a garden side seating option, and a rocking chair will complete the picturesque front porch. But for unrivaled comfort and relaxation outdoors there are few styles that can match the casual elegance of a chaise lounge. If you want to relax in style by your sauna or pool investing in a chaise lounge is a smart move. With dozens of manufacturers online and a unique yard all your own, the number of options to take into account can be overwhelming. We’ve streamlined the process in our chaise lounge shopper’s guide so you can purchase a new chaise with confidence. Step 1: What Are Chaise Lounges Used for Outdoors? A chaise lounge is the perfect outdoor furniture option for yards with pools. Featuring full-body support and an angled back, the shape of an outdoor chaise lounge is ideal for relaxing or dozing. Position a couple of chaise lounge chairs next to your pool for a natural sunbathing spot — work on your tan while keeping an eye on the kiddos splashing nearby. A chaise lounge will sit closer to the ground than a bench, outdoor deep seating sofa, or a standard rocking chair. Keep this in mind if anyone in your family has mobility issues — comfortably getting in and out of a chaise lounge is easier if you can squat lower to the ground. The contoured comfort of a chaise lounge is made more practical with the addition of a cushion so you can comfortably relax the day away. Complete your chaise lounge with a side table so you can sip your favorite tea and set down the latest page-turner when it’s time for a nap. 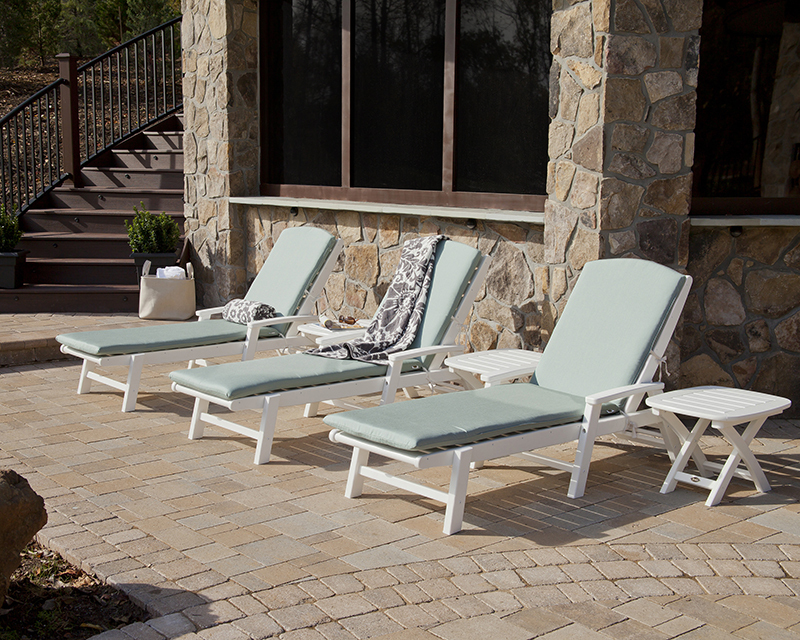 Chaise lounges cover more square footage than most single-occupancy outdoor furniture options, as you have enough room to splay out in the sun for a cozy afternoon nap. Fittingly, smaller decks or patios may not be the right fit for a chaise lounge set. 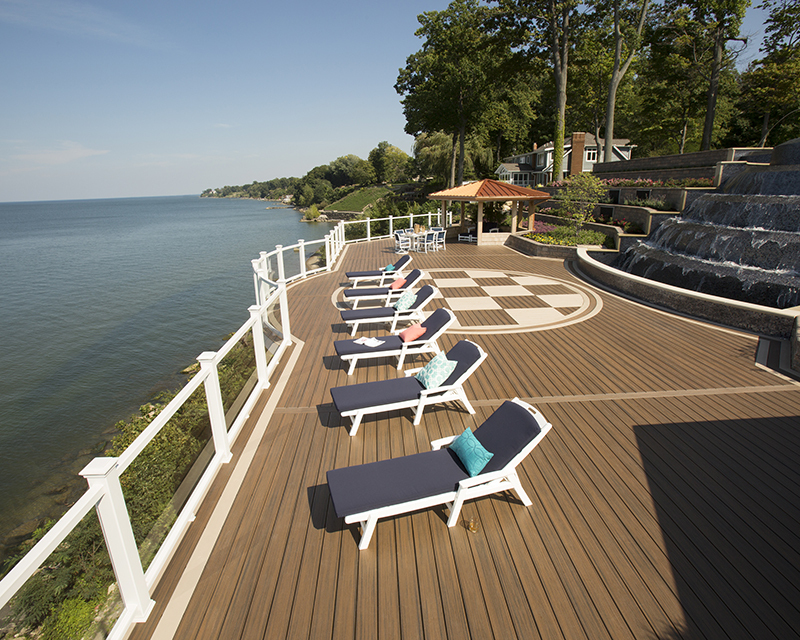 A chaise lounge is the right choice if you want to break up a larger space with zones, or if you the pathways leading to your pool or waterfront contain enough space to take in the view. 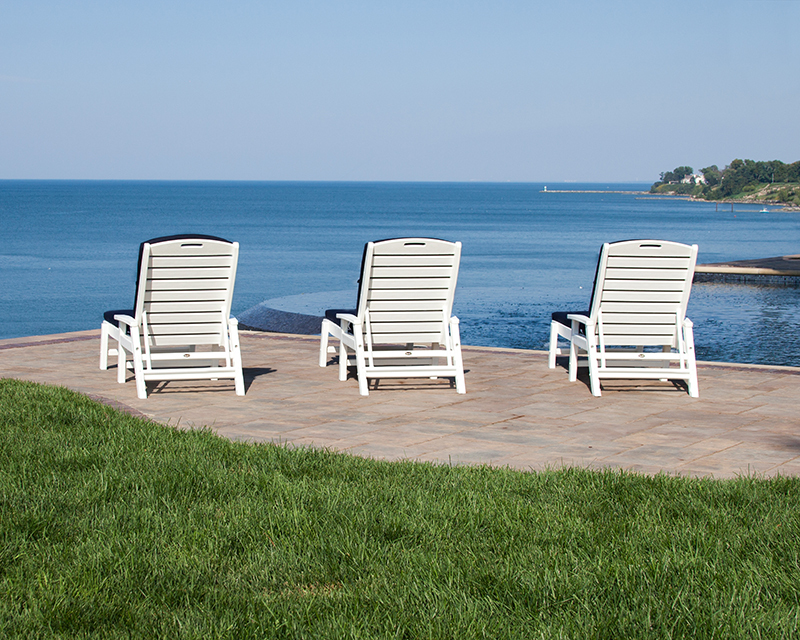 A chaise lounge from Trex® Outdoor Furniture™ will measure 16.75” tall, 27” wide, and 78.5” long. This length is the most important measurement when planning your poolside or oceanfront outdoor area — as you’ll need plenty of space to accommodate a chaise lounge. The width measurement includes the spacious armrests; the seat itself measures 21” wide, which is still plenty of room for a single person. The seat height is 12” off the ground. When arranging a set of chaise lounges in any outdoor space leave around two to three feet between each chaise for easy access. Account for additional space behind and in front of each chaise lounge so you can navigate around your deck or patio without any obstructions or issues. Measure your space and consider the lengths and widths above to decide if a chaise lounge will comfortably fit in your outdoor lounging area. Softwoods are in abundant supply and are inexpensive to manufacture. Because of this, they’re not ideal for long-term outdoor furniture. Softwoods will crack, chip, and rot after a fair amount of use. Softwoods won’t last for several years. The appearance of softwood will quickly degrade. Softwood placed outdoors must be varnished regularly and will still show signs of wear and tear. Hardwoods are a stronger material than softwoods, but have their limitations. Hardwoods will not dent or scratch easily, though they can be damaged by water. Hardwoods last longer than softwoods. Hardwoods have a polished appearance. Hardwood must be stained and varnished often to maintain quality. Wicker is a traditional material that has clear advantages and shortcomings. Wicker is less comfortable than more expensive materials. Wicker can be damaged very quickly when exposed to the elements, as it is not intended for outdoor use. Wicker’s longevity depends on where it is placed – indoor wicker can last several years. Wicker has a distinctly rustic look. Wicker is hard to clean. Teak is the most durable wood option for outdoor furniture. Teak is a comfortable material option. Teak is resilient and can remain outside, as it produces its own oil. Teak can last several years if properly maintained. Teak is only available in one “color,” teak. Teak must be rubbed down frequently to avoid the “silver patina” discoloration. HDPE (high-density polyethylene) is an extremely durable plastic used to construct weather-resistant, high-quality furniture. The long-lasting nature of the material is reflected in the price. HDPE lumber is luxurious and designed for maximum comfort. HDPE lumber is completely resistant to wind, water, and rust. You can leave it outside all year. HDPE lumber is manufactured to last for decades. HDPE lumber is available in a wide variety of attractive colors. HDPE lumber is simple to clean — just use warm water and mild soap. At Trex® Outdoor Furniture™ we manufacture our chaise lounges with top-quality HDPE lumber so our furniture lasts generations. Ultimately your choice of material for your outdoor chaise lounge will be based on your budget and your needs. Stackable Yacht Club Chaise With Arms – This quintessential outdoor chaise lounge offers adjustable positioning, folds flat for easy stacking, and is available in a variety of attractive, fade-resistant colors. The casual yet clean design features contouring that supports all body types, and the HDPE lumber won’t crack, rot, or splinter in the sun. 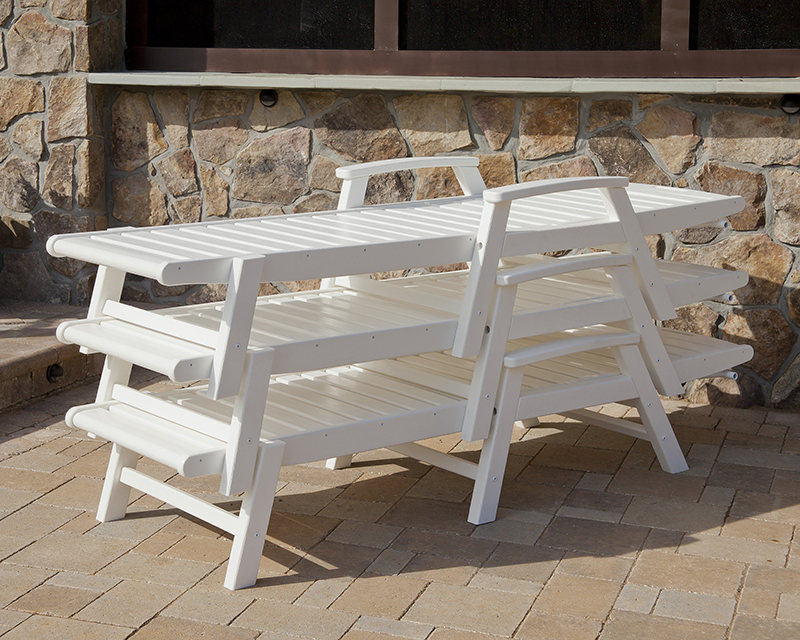 Yacht Club Wheeled Chaise – genuine POLYWOOD® lumber is the most weatherproof lumber on the market, but that remarkable resilience means it can get heavy. Upgrade our Yacht Club Chaise with the addition of two convenient wheels on the back legs for easy relocation throughout the year. This version is ideal for families who need to stow away or reposition outdoor furniture as the seasons come and go. When you’re storing the chaise lounges for winter a pair of wheels is a lifesaver. 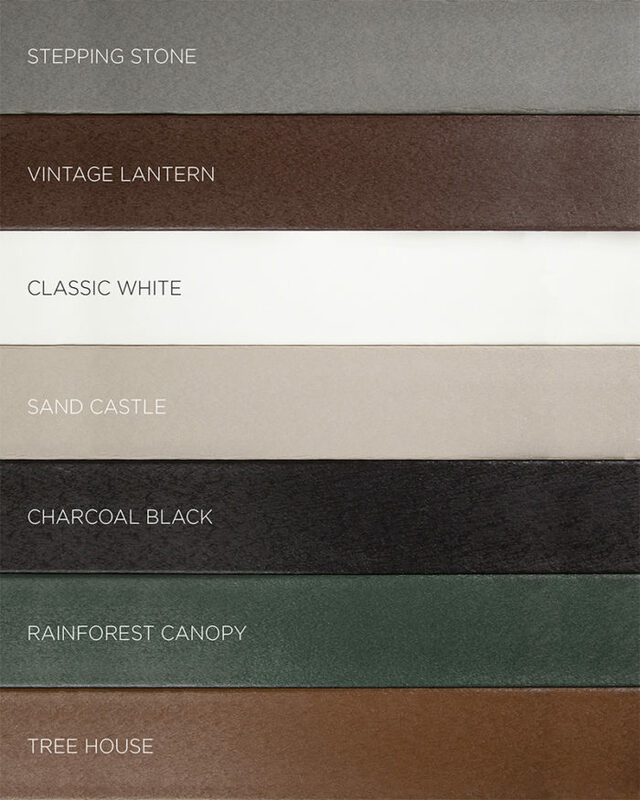 If you decide to order an HDPE lumber outdoor chaise lounge from Trex Outdoor Furniture you have the choice of a variety of rich earth-tone hues, all of which will effortlessly complement the existing design elements surrounding your pool or patio. When you choose the Stackable Yacht Club Chaise you can order a Full Chaise Cushion available in eight unique and vibrant color options for plush, daylong support. Shop today to select a beautifully crafted chaise lounge for your home that will weather any storm while retaining its original quality.